DavidNews HYIP blog - News & Reviews: Cryptocurrencies – is it too late to start investing or is it exactly the right time? 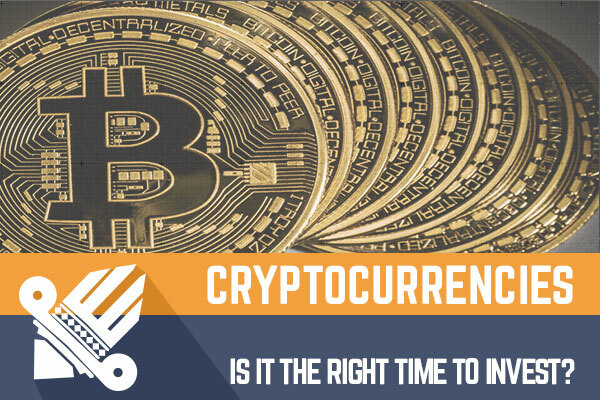 Cryptocurrencies – is it too late to start investing or is it exactly the right time? Probably some of my readers remember an article about Litecoin I published on DavidNews.com a couple of years ago when Bitcoin price hit a record peak of $1000 (a major for that time). Of course, shortly after the dramatic increase, the value of bitcoin plunged affecting Litecoin value as well. A year ago, Litecoin price was under $5, but currently, it has increased to a couple of hundred bucks, however this time the story is not about the Litecoin. Nowadays cryptocurrencies are springing up like mushrooms. And each one claims to be better than the other. Governments around the world lack a regulatory framework for cryptocurrencies, banks are banning cryptocurrency purchases with credit cards and cryptocurrency exchanges are increasingly attacked by hackers - these are the main reasons why cryptocurrency prices are dropping these days. One of the latest Bitcoin price drop was significant – from $20 000 to $5 000. At the same time, Swiss banks point out that cryptocurrency (Bitcoin) best days are still ahead and work heard to improves the management of their cryptocurrency holdings. Even some countries consider issuing their own cryptocurrencies! And as we have seen lately, Bitcoin price continues to recover. I must admit that I feel pity for all of you who bought Bitcoin for $19 000, sold for $7 000 and probably now buy again for $11 000. Guys, you both harm your mental health and lose your money! But this time I don’t want to talk about them who started to sell their Bitcoin (or other cryptocurrencies) when the value started to drop. At the end of the last year, I bought 12 different cryptocurrencies (12 cryptocurrencies from TOP 20 cryptocurrencies by their total market value) for an amount of money which won’t even ruin my day if the value of the cryptocurrencies would drop for 99%. I will put them aside for a year or two and I am sure that at the end my investment will pay off (at least three times). Why am I so sure? I just don’t make my investment decisions relying on information in the media. The news is full of attention-grabbing headlines pointing out that Bitcoin value has dropped by more than 30% in a week, to cause panic among the cryptocurrency owners. However, only a few mention the thousand percent increase of cryptocurrency value in the long run. The internet is another wold, therefore sooner or later the internet will create its own payment method. Is it going to be a cryptocurrency? Right now, I would say yes. Another thing that convinces me – billions of dollars have been invested by the world’s smartest and richest people in the development of blockchains and cryptocurrencies. And I am sure, they will do everything to evolve demand for cryptocurrencies. Investors always remember where they have lost the money, but they remember even better where they could have earned but didn’t invest. Unlike HYIP programs, it is not possible to lose everything if you decide to invest in cryptocurrencies. The chance to multiply your profits is quite significant. Join 1,000,000's who have already discovered smarter strategies for investing in LiteCoin.